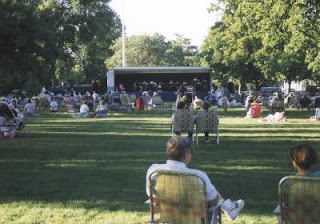 Tomorrow night (July 7) is the first of a series of BayPath Summer Sunset Concerts. Come enjoy the outdoors and gather with friends and family on the “Longmeadow Green” In case of rain, concerts will be held in the Community House. Bring some lawn chairs, your blanket and a picnic lunch and enjoy a wonderful array of soft, family oriented music. Refreshments will be available for purchase. Come and relax and enjoy the sounds of music during the summer. Sponsored by Berkshire Bank. Enjoy classical and light popular music as the history of brass musical instruments come alive through performance, lecture and show and tell. The concert reviews the history of brass instruments such as the trumpet, trombone, french horn and tuba with performance demonstrations on the following historic instruments: Keyed Bugle 1820, Ophicleide - 1835, rotary valve Eb cornets - 1860, Eb rotary valve tuba 1870, Two Valve Cornopean - 1850 , two valve french horn - 1830. Sponsored by Hampden Bank. Under the direction of Lenny Gomulka, Chicago Push, since their inception, have continually received awards from various radio stations across the country, booster clubs, promoters within the field, and organizations such as the International Polka Association, United States Polka Association and the United Polka Association. Performances throughout the years have generated the granting of keys to many city's. Lenny Gomulka & Chicago Push, noted for their unique arrangements and innovative musical techniques, have mentored many aspiring bands and musicians. Sponsored by PeoplesBank. Ray Guillemette Jr. is one of today's leading, premier, Elvis Tribute Artists. Let this 9-time, International 1st place Elvis Presley Impersonator rock your world with his striking look, outstanding vocal range and unabashed excitement. Ray delivers with the style and energy that was Elvis. Put on your blue suede shoes for a night of dancing to the songs Elvis made infamous of the 50’s-70’s. We are looking for stories of local interest to Longmeadow residents. If you have a newsworthy event, controversial issue or other item that you wish to share with other Longmeadow residents, please consider sending it to us for posting on the LongmeadowBuzz blog. LongmeadowBuzz is an open forum for publicizing and discussion of local topics of interest to the residents of Longmeadow, Massachusetts. If someone is interested in contributing an article to the forum, simply send the information (including any photos, links to YouTube videos, etc.) to LongmeadowBuzz@comcast.net. Please include your name and address since we are limiting participation to Longmeadow residents. Let us know if wish your name/ address to be included with the posting. We are discouraging anonymous postings since we want this venue to be like a web based "letter to the editor". Anyone can post a comment to a posting but we disencourage anonymous entries. All comments on this forum are moderated to eliminate objectionable content. The LongmeadowBuzz blog is not supported financially or in any other manner and all opinions are strictly those of the listed author and do not represent official town policy. Send any questions or other inquiries to LongmeadowBuzz@comcast.net.